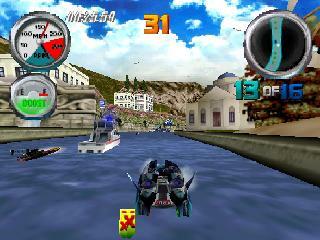 Hydro Thunder is a boat racing game that was first released in the Arcades in 1999. It consists of a 1 player Tournament mode, as well as Multiplayer (1-4 players). The former consists of Easy, Medium and Hard competitions that contain three courses each. The objective is to finish courses within a certain position (in order to unlock bonus courses and extra boats), and collecting Boost icons is crucial to succeeding. Gameplay wise, it's reminiscent of Excite Truck (2006, Nintendo Wii) due to its exotic course design, boost jumps and the fact that you always feel close to being out of control! Each boat is responsive, and I like how many vehicles are included to cater towards different play styles. While there isn't really a focus on enemy combat, it's endlessly satisfying to send an opponent flying by crashing into them while boosting! The water physics are great and although they're not as realistic as Wave Race 64 (1996, N64), they still provide some brilliant push and pull against your vehicle. The Easy mode is a breeze, but Medium forces you to replay each course to find all the shortcuts and eventually qualify; it can be annoying to continually restart the same track but it does encourage you to perfect every trick in the book to shave off previous seconds; when you do successfully pull off a boost start, use all of the shortcuts, boost jump to grab extra turbo and finish ahead of the necessary opponents it's an absolute rush and a very rewarding experience. The course design is top-notch too with varied scenery (e.g. the Nile Adventure track features breakaway sections that create chaos! ), but I do wish there were more tracks on offer. The multiplayer mode offers a worthwhile distraction, but you can't race alongside A.I. opponents and the tracks can only be raced one at a time (e.g. no tournaments). Hydro Thunder doesn't have enough content to satisfy you for more than a couple of days, but it's still a fantastic game that's definitely worth a look if you enjoy tough Arcade racers. The stunning track design is the main highlight here and the fact that it's complimented by excellent controls makes this a must-play. Random trivia: The game was also a launch title for the Sega Dreamcast in 1999.